SeQual Eclipse 5 with AutoSAT Personal Ambulatory Oxygen System, the best in class just got better! The new Eclipse® 5 incorporates many suggestions SeQual has received from customers, patients and physicians. It has several new innovative advancements that will make the Eclipse 5 the best portable oxygen concentrator in its class. For you, the SeQual Eclipse 5 truly is the smart choice. The Eclipse 5 Portable Oxygen Concentrator is the only small, lightweight, low maintenance portable oxygen system that provides both continuous flow and pulse dose oxygen therapy consistent with accepted standards of care. The internal auto-recharge power cartridge of the Eclipse 5 enables easy movement between AC power outlets without interruption of oxygen therapy. The SeQual Eclipse 5 eliminates the need for long lengths of tangled oxygen tubing to move about. The Eclipse 5 gives users the freedom for extended travel without the fear of running out of oxygen. Just plug the Eclipse into your auto accessory (lighter) outlet and travel as far and as long as you like. Not only can you take the SeQual® Eclipse 5 Portable Oxygen Concentrator in your car, but you can also take it on airplanes, cruise ships, trains, buses and every other modes of transportation. *** Upgrade*** The Sequel Eclipse 5 can run on both Continuous flow and Pulse flow settings while plugged into the AC outlet in your car, unlike the Eclipse 3. For Huge Savings on Portable Oxygen Concentrators call us at 1-855-412-6600 and ask about our Daily Specials and Demo Units! ALL FLOW SETTINGS UP TO 3 LPM WILL WORK WHEN PLUGGED INTO THE CAR (AC POWER). BATTERY WILL CHARGE WHEN UNIT IS CONNECTED TO DC POWER ON ALL SETTINGS. 4 PULSE DOSE VOLUMES OF 16-96, 128ML, 160ML and 192ML. ML AND LPM DOSE DISPLAY. THREE AVAILABLE RISE TIME OPTIONS--FAST, MEDIUM and SLOW. NEW INNOVATIVE CART DESIGN ALLOWS FOR EASY ACCESS TO THE BATTERY. NEW AC AND DC ADAPTERS THAT ARE SMALLER IN SIZE BUT YET MORE DURABLE. Up to 3 LPM continuous flow oxygen for nocturnal use, exercise, and other times when pulse flow just won't do. For times when pulse flow is the choice, the Eclipse has pulse settings from 1 to 6 LPM. SeQual Eclipse 5 runs on household AC current, DC from an auto accessory (lighter) outlet, or its internal auto-recharge power cartridge. The new Eclipse 5 has rugged good looks, is easy to use, easy to clean and easy to service. Long service intervals for lower product life cycle costs. A power miser, the low electrical consumption means less heat and noise with a longer product life. Eclipse 5 is lightweight and easy to move, making the Eclipse the perfect home concentrator that you can take with you! Never run out of oxygen at home or in the car with the Eclipse 5. No concerns about storing oxygen in the home. SeQual Eclipse 5 Portable Oxygen Concentrator includes a 3 year warranty. SeQual Eclipse is small, lightweight, easily moved about, and lifted up stairs or into an automobile. SeQual Eclipse telescoping handle cart facilitates movement in or outside the home. AC, DC and on-board auto recharge power cartridge enables longer excursion times and even extended overnight travel. Eclipse 5 Concentrator eliminates waiting for oxygen deliveries. Simple easy-to-use controls. No need to learn how to operate several devices. Quiet operation without purge noise or pulse mode clicking. New Eclipse 5 has a hi-tech, easy-to-clean non-medical look. 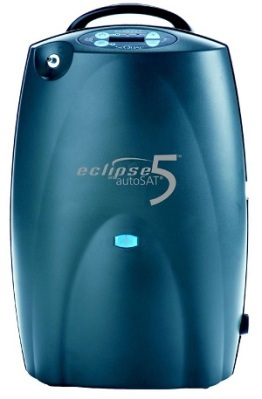 SeQual Eclipse Concentrator is compact and unobtrusive. No need to rearrange the room around the concentrator. The SeQual Eclipse 5 is approved to be used on airlines, railways and cruise lines. The SeQual Eclipse is now approved for in flight use with over 20 major airlines. Please read the individual airline requirements carefully before proceeding with flight plans. The SeQual Eclipse Concentrator is approved for use in railways too! Many cruise lines allow portable oxygen concentrators, such as the SeQual Eclipse, on board the ship, but each have individual requirements, such as 48 hour notice and/or a physicians statement. Each cruise line has a Special Needs Coordinator that can answer any questions regarding your travel and they should be contacted directly about any questions regarding use of your SeQual Eclipse on board the ship.